The day when four of the five senior most Supreme Court judges - Justices Chelameswar, Ranjan Gogoi, Madan Lokur and Kurien Joseph - held their press conference to question CJI Misra’s decisions to allocate important cases, Justice Arun Mishra was assigned the case of CBI judge Loya’s death. One of the judges who participated in the morning tea session at judges’ lounge at Supreme Court to settle the unprecedented rift in the top judiciary, nearly broke down during the meeting. According to a report published by news agency IANS, Chief Justice of India Dipak Misra and Justice Jasti Chelameswar had to come together to comfort him. 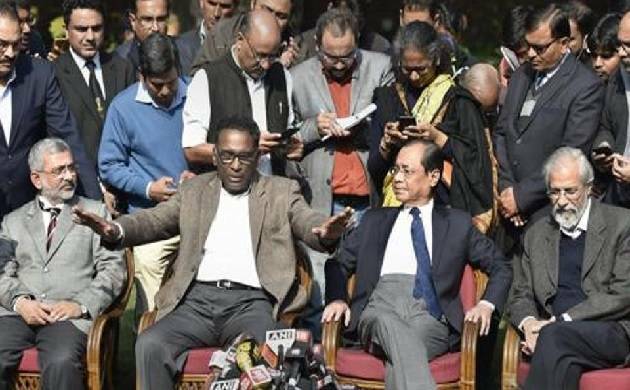 Justice Chelameswar was seen with his arms wrapped around the shoulder of 62-year-old Justice Arun Mishra, who will also hear a petition on Tuesday seeking an independent investigation into the death of CBI judge BH Loya. Both Chief Justice Misra and Justice Chelameswar led an emotional Justice Arun to his chamber. During the tea session, Justice Arun Mishra said he was being "unfairly" targeted by Justice Chelameswar and three other judges, who raised questions about his "competence" and "integrity", news agency IANS reported. However, the name of Justice Arun was not mentioned by any of the four judges who held the unprecedented press conference on Friday questioning CJI Misra’s decision to allocate major cases including the case of CBI Judge Loya. The day when four of the five senior most Supreme Court judges - Justices Chelameswar, Ranjan Gogoi, Madan Lokur and Kurien Joseph - held their press conference, Justice Arun Mishra was assigned the case of CBI judge Loya’s death. CBI Judge Loya, who died under “mysterious” conditions in 2014, was hearing the case of the alleged fake encounter of Sohrabuddin Sheikh in which BJP President Amit Shah was also an accused. Justice Arun said, former Chief Justices TS Thakur and JS Khehar also assigned tough cases to him. On this, Justice Chelameswar went near to him and putting his arms around his shoulder said they only raised issues and were not against them.